Now View Camera photographers can have the lenses they want, for less, by using the Instant Rebate Code 27686. More than 40 different Schneider lenses for view cameras are eligable for instant rebates through September 30, 2009. Schneider Optics, the lens and professional filter manufacturer, makes it possible for film and digital view camera photographers to buy the Schneider lens they want now, and get an instant rebate of $200 or $400 right at the point of sale. No papers to fill out and mail. No waiting for the rebate check to arrive. This rebate is instant. The offer ends September 30, 2009. How to get the rebate. Photographers should contact or visit any participating Schneider dealer found on the list at http://www.schneideroptics.com/rebate. After getting a price quote from a dealer that meets their needs, photographers then tell or give the dealer the Instant Rebate Code Number 27686. That's all it takes to get an Instant Rebate on the spot, right then and there. "Many people don't realize that there are thousands of photographers working every day with both film and digital view camera systems, which remain unmatched for certain kinds of fine arts photography, commercial photo studio imaging, architectural photography and landscapes," said Don Shafer, Regional Sales Manager for Schneider Optics. "Our lenses, along with view cameras with and without digital backs, give photographers incredible photo-versatility not available with smaller formats and lesser lenses. Now, for the first time in recent history we are giving photographers $200 or $400 back, to help them get the lenses they want and need." The well-proven Apo-Symmar lens series has been redesigned to the current state-of-the-art. Virtually all covering power has been expanded and imaging performance optimized. Focal lengths between 120 and 480 mm deliver normal perspective pictures without wide-angle or telephoto effects. This 5-element telephoto lens system has a 35-degree view angle for use with a focal length of 400mm for formats up to 13cm X 18cm and with a focal length of 800mm for formats up to 30cm X 40cm. For maximum sharpness, detail reproduction and richness of tone, serious photographers often use very large cut-film between 8"x10" and 20"x24." These lenses are designed to meet this need. Both provide low distortion, uniformly high resolution over the entire 900mm image circle, and large adjustment reserves, even with the popular 7"x17" and 8"x20" panorama formats. XXL lenses have filter threads front and back. Designed for medium and large formats; excels in close work. Has an 8-element lens computed for 1:1 that can be used for copying flat objects and other material with the highest resolution with reduction or enlargement of 1:2 or 2:1, extendable to 1:4 and 4:1 for normal product and table-top photography and machine vision applications. This is a special purpose, ultra-wide-angle lens for medium and large format photography. These compact 6-element, 4-component aspheric lenses have a 105-degree angle of view. Ideal for the most demanding studio applications, they enable the extreme camera movements required for architectural and dynamic studio photography and provide a brighter and more uniform screen image. The first genuine wide-angle focal lengths for view cameras with digital backs. With an image circle of 60mm to 110mm they have capacity for adjustment, correction of perspective "converging lines" as well as for depth of field control according to the Scheimpflug law. This large range of closely staggered focal lengths guarantees the most suitable lens for digital cameras and every angle of view and the image circle diameter. Apochromatic correction reduces color fringing. The meticulous flattening of the field curvature of these lenses enhances the advantage of the perfectly plane digital sensor surfaces. Sharpness is still fine even at higher scales. 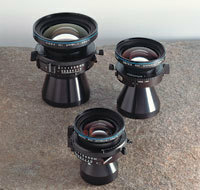 These lenses provide the ultra-high resolution essential for today's CCD sensors and the next generation, as well. Large image circles enable all the tilt and shift adjustments of professional studio cameras to be used in macro digital photography. For more information contact Schneider Optics, Inc., 285 Oser Avenue, Hauppauge, New York, 11788, USA. TEL: 631 761-5000; FAX: 631 761-5090; EMAIL: photo @schneideroptics.com, or visit http://www.schneideroptics.com.